When uploading or downloading a scene, Harmony prepares the export package with only the changes in the scene, zips it, sends it over the Internet, unzips it and finally imports it, updating the destination scene. This is done directly in Harmony Premium or Harmony Advanced; there is no need to do this in the Web Control Center. Open a web browser and connect to the Web Control Center—see Connecting to the Web Control Center. From the Scenes list, select the scene on which you want to work offline. In the Export Offline pane on the right, click Export Offline. The Export Offline window opens. Select the Checkout option to check out the scene. NOTE: As a general rule, you should check out the scene from Web Control Center before working on it. Otherwise, there may be conflict issues if another user checks out the scene while you are working on it. The Export Completed confirmation window opens. Select File > Manage Uploaded/Exported Files. 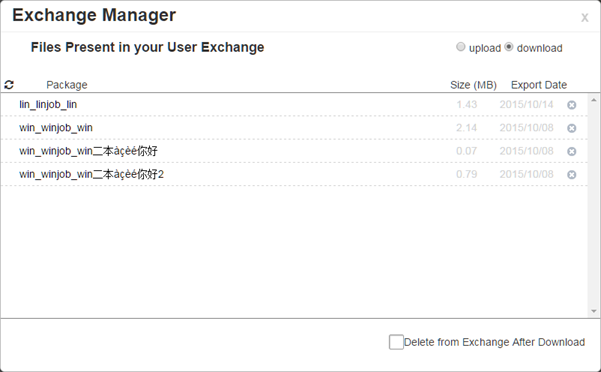 The Exchange Manager opens and displays the files in your user exchange. Select the Download option in the upper-right corner. (Optional) Select the Delete from Exchange After Download option to remove the package from your user exchange after you have downloaded the scene on your computer. Click the file you exported offline. The scene downloads to your computer. In Harmony, open the Preferences dialog box by pressing Ctrl + U (Windows/Linux) or ⌘ + U (Mac OS X). In the Web Control Center section, enter the host name and host port. If you are unsure, consult the studio's system administrator for this information. ‣ Host name: Name of the Web Control Center server name. ‣ Host port: 8080 (the default port number) or custom port number set by the system administrator. Locate and open the downloaded scene and make whatever changes are needed. To perform a partial scene update, select File > Update Database Scene. 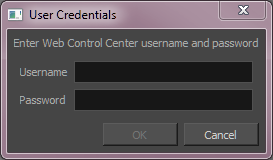 The User Credentials dialog box opens. 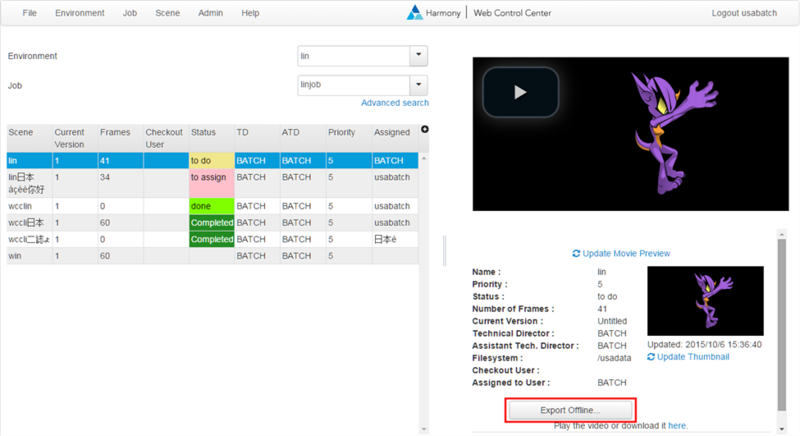 Enter your username and password for Web Control Center and click OK.
Harmony prepares the export package with only the changes in the scene, zips it, sends it over the Internet, unzips it and imports it back into the database. You can perform as many partial scene updates as you like. ‣ In the Scenes list, right-click on the scene and select Checkin. ‣ Select Scene > Checkin. In Harmony, open the scene to update. From the top menu, select File > Download Database Changes. Harmony prepares the export package with only the changes in the database scene, zips it, sends it over the Internet, unzips it and imports it to the offline scene on your computer. You can perform as many partial database scene downloads as needed.